Busy, satisfying day at work today-so without further delay & a long intro here's this week's link review! Excellent thesis examination day so far! From #Myanmar to #Scotland, #Venezuela, #Sweden & #Chile our students cover amazing #globaldev & #C4D ground! In a season of lists and predictions, many of them dark, it’s easy to forget what underpins much humanitarian work: hope for change. IRIN with a critical-optimistic outlook into the new year! The increase in the number of laws and policies closing and shifting civic space remains a huge threat to voice and public accountability. The ongoing clamp down on fundamental rights and freedom of association and expression in Nigeria, Niger, Uganda, Mozambique, Cameroun and Rwanda, as well as the upcoming elections in at least 12 countries this year, raises the need for a continuous engagement in existing space and creating new spaces (formal and informal). Apollos Nwafor for fp2p with some topics to keep on your radar for 2019! Last, but not least the WHO joins in with some challenges to global health & #globaldev! "The Commission has heard multiple staff raise concerns of elitism... racism and colonial behaviour... sexism, rigid hierarchies and patriarchy that affect relationships among Oxfam staff and between Oxfam staff and its partners and program participants. "Staff were highly critical of both management behaviour and company procedures for dealing with bullying, harassment and sexual misconduct. Lizzie Roberts for the Independent with a first look at the Oxfam report by their Independent Commission on Sexual Misconduct, Accountability and Culture Change. “This tells me two things: first - that we still have a long way to go before we are able to fully and openly discuss sexual harassment; and second - that there may also be an ongoing sense of mistrust, perceptions of inaction and lack of accountability,” he wrote. The world’s developing countries, comprising over two-thirds of the 193 UN member states, are complaining they are not being adequately represented in the higher echelons of the world body –- despite competent candidates with strong professional and academic qualifications vying for these jobs. Thalif Deen for Inter Press Service with a reminder that the global development bureaucracy is not just about a new World Bank president. 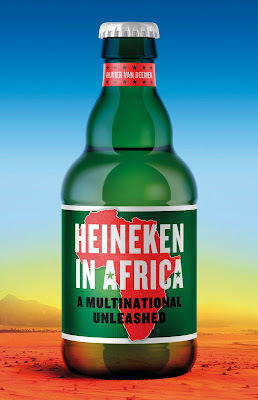 The decision of a number of US and European outlets - including the UK's MailOnline and Germany's Bild - to use the photograph was instantly condemned on Kenyan social media. The New York Times came in for the most criticism. The newspaper, angry users said, was using the "misery and tragedy" of Tuesday's terror attack on the Dusit hotel for clickbait. Flora Drury for BBC News on the visual fallout of the Nairobi attack. How Do You Ethically Photograph A Terrorist Attack? On a personal note, thinking purely as an editor, I could see news value of the photo in question. It’s visceral, disturbing, and heartbreaking. It gives the viewer a sense of being in the room where the horror of yesterday’s attack happened (BRIGHT Magazine’s offices are just a few kilometers away). However, I don’t think I would have run the photo while the attack was still ongoing. Yesterday’s attack was a tragedy for Kenya, especially those who lost loved ones. It was also a teachable moment for journalists, and especially editors, who have to make snap decision in the midst of tragic breaking news. How much bloodshed do we show? Do we cover deadly events taking place a world away the same way that we would cover events in our own communities? Meghan Dhaliwal for Bright Magazine responds to the debate on the NYT photos from the Nairobi attack with personal & professional reflections. Emma Graham-Harrison for the Guardian also mentions Susan Williams' excellent book, probably my favorite read of 2017. “Here, we solved our problem,” says Rawal. “Keep god at the temple, let woman stay at home then god will be happy and women will be safe too. Nedgine Paul Deroly for Bright Magazine with an interesting case study about decolonizing education in Haiti. An old adage has it that councils of war never fight, meaning that decision-makers often get caught up in deliberations rather than making and implementing decisions. That may not be so bad in the case of war, but what about peace? Do the councils of peace or UN peacekeeping operations deliver what they set out to do? Severine Autesserre for Russia Today (I know...it's complicated) with great insights into her peace research scholarship! Perhaps most difficult of all, there are a range of equity and oversight issues that come with shipping expatriate staff into places with weak regulatory systems. safeguarding and abuse, and the efficacy of current initiatives in the sector. Christine Williamson for Rethinking Fragility. I started to listen to the podcast and it sounded really interesting! DevEx's Margaret Richardson talks to Andrea Koppel for time4coffee-another interesting podcast! Migration for work within India is highly circular, with migrants working in multiple destinations during their lifetimes, and retiring in their native places. As per the Economic Survey of India 2016-17, there are over a hundred million migrant workers in India, of which most are circular migrants. The durations can be as short as a day or a week, in which case they are referred to as commuters, numbering in the tens of millions, who frequently board trains and buses bound toward a nearby town or city. A few more tens of millions migrate seasonally for work—for a few months of the year, drawn disproportionately from the Scheduled Castes and Tribes and from particular clusters in central India (see map). They work in precarious worksites in sectors ranging from construction and brick kilns to rural harvesting operations. 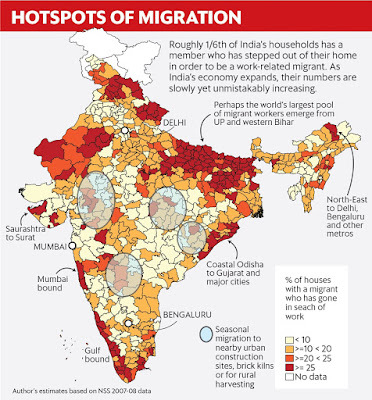 Chinmay Tumbe for Live Mint with a great overview over India's domestic migrations flows. Regardless of the development and use of information and communication technologies (ICT), the practice of mediation still relies first and foremost on the trust built between a mediator and conflict parties, and the ability to generate and maintain buy-in to peace processes. Mediation teams have a responsibility to be generally literate about the technologies present in the mediation environment and their effect on the mediation process, and to make informed choices about their use. At the very least, mediators need to understand the risks associated with these technologies, and how to mitigate them. The use of ICT should never be assumed to be fully secure. Several mediators report that accepting the threat of information disclosure through network monitoring by governments is often the only realistic approach. I really don't like to rant, but next time I come across a publication without a landing page I won't include them in my review. I really don't like to go through the full pdf doc for the details I need for my review! Duncan Green for fp2p reviews Robert Chambers' latest book-a great way to boost your 2019 reading list! Multiparty elections have become the bellwether by which all democracies are judged, and the spread of these systems across Africa has been widely hailed as a sign of the continent’s progress towards stability and prosperity. But such elections bring their own challenges, particularly the often intense internecine violence following disputed results.While the consequences of such violence can be profound, undermining the legitimacy of the democratic process and in some cases plunging countries into civil war or renewed dictatorship, little is known about the causes. By mapping, analysing and comparing instances of election violence in different localities across Africa – including Kenya, Ivory Coast and Uganda – this collection of detailed case studies sheds light on the underlying dynamics and sub-national causes behind electoral conflicts, revealing them to be the result of a complex interplay between democratisation and the older, patronage-based system of ‘Big Man’ politics. Mimmi Söderberg Kovacs & Jesper Bjarnesen with some interesting, open access background reading on African politics. Can you imagine a world without Think Tanks?